In Sanya, many shopping malls in major areas have offered their holiday promotions to give visitors the opportunity to make up for the holiday fun due to the impact of bad weather. Jewelries, local specialties, Hainan island tropical-style clothes and the Sanya Duty Free Shop are the main targets of the shopping spree during the holidays. Ruixin, a major Sanya jewelry store, witnessed a jump of 30% in sales compared to normal rates as the store launched a sales promotion to attract customers during the holiday. 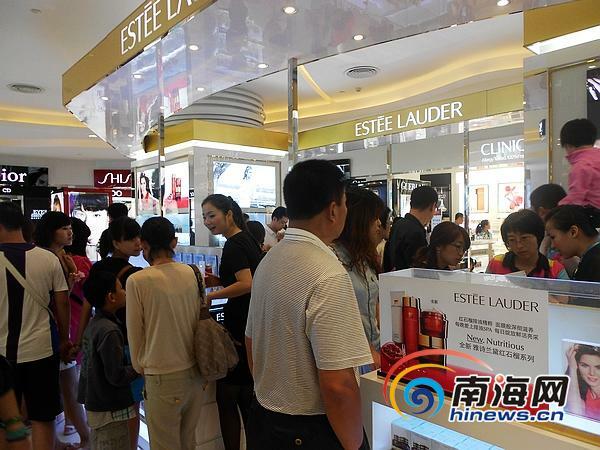 On the first day of the holiday, the Sanya Duty Free Shop has witnessed flocks of visitors. Items like cosmetics and watches are among the most popular by many visitors. According to the Sanya Duty Free Shop, the company has made comprehensive preparation in products supply for the shopping boom periods.